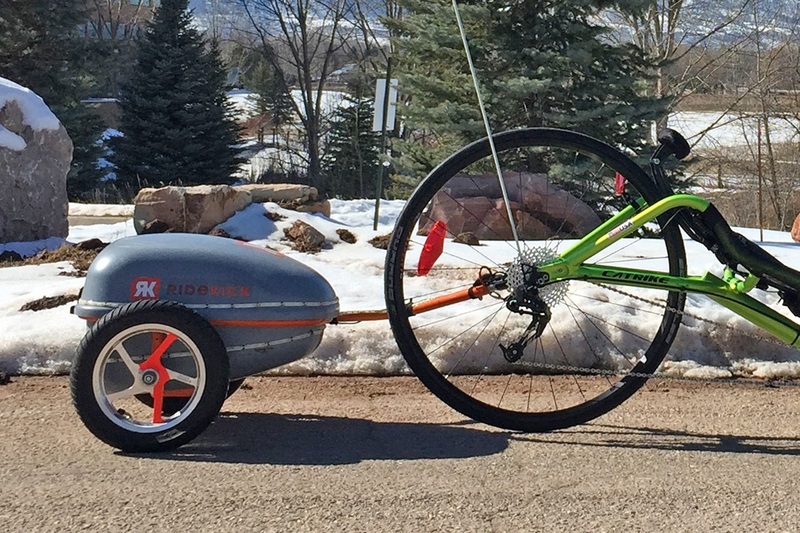 Thinking about an electric assist for your recumbent trike or bike? 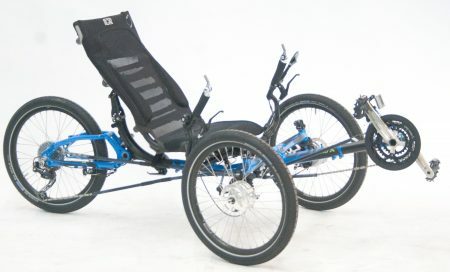 Here at the Bicycleman we have been installing electric assists on recumbents since 2008. There are a lot of options and conflicting opinions about electric kits so we wanted to provide an introduction to help you get started. The most common problem we hear is the “I can’t keep up with my husband/wife”, closely followed by “the hills seem to have gotten bigger while I wasn’t looking”. Electric assists can help solve all these problems. There are three basic styles of electric conversions. A hub motor, a mid drive motor and a “pusher” style motor. We’ve installed all of them and I’ll give you an idea of how they work. 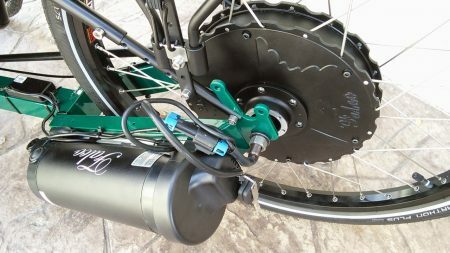 The hub style consists of a controller, a battery and a motor that replaces either the front or the rear wheel axle with an electric hub motor which “drives” the wheel. These are the simplest and most common kits available. Most of them retain the original drive train and just need the wheel installed and a way to mount the battery figured out and a throttle and/or control center wired up. The mid drive style consists of a motor mounted in a special bracket that usually attaches near the crank or in the bottom bracket area and propels the recumbent by applying power to the chain. That’s a great way to do it because the gears can multiply the force the motor and the rider are providing in a very efficient way. The downside is that they are more complicated to install and often need some modifications to get everything playing nice together. Sometimes there is a secondary chain linking the motor to the crank which can be fairly noisy and hard to align. The “pusher” style is a motor and battery mounted in a pull behind trailer that “pushes” the recumbent by having the trailer wheels supply the power to the road and push on the back of the bike at the rear axle. 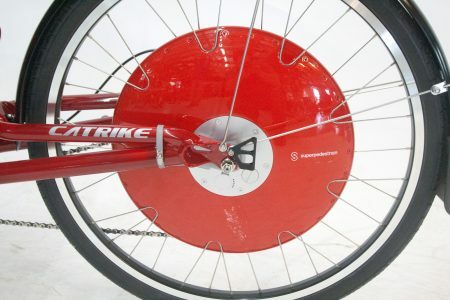 The good thing about this style is the ease of use and the ability to remove it easily for transport or if you forgot to charge the battery but still want to ride. The bad is that the tires can spin in loose dirt or gravel and that the unit works best as a short term boost up a big hill than as an all day assist. Another important difference when choosing an assist is in how you control it. The motors can be controlled in a couple of ways. Some have either a twist throttle (like a motorcycle) or a thumb throttle (like a snowmobile). 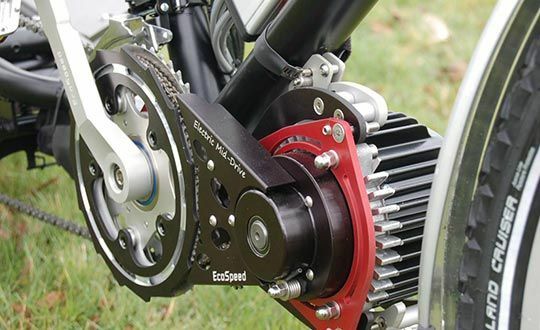 Others are controlled by a torque sensor and a control display that allows the rider to set how much assistance they would like from the motor as they pedal. I think this distinction is an important one to understand. 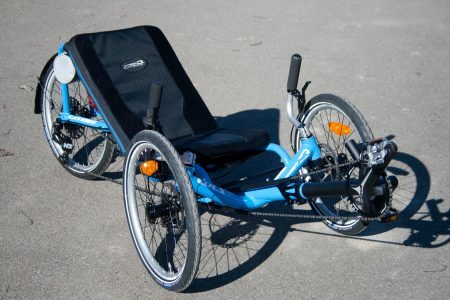 The throttle controlled versions turn your recumbent into a car surrogate. Twist the throttle and it goes-with or without your help. The torque sensor style is assisting you while you pedal. When you coast it shuts off, when you begin to pedal again it senses how hard you are working and multiplies your effort by the percent you set it to. Some companies are combining the two types of controls. This seems the best approach to me. 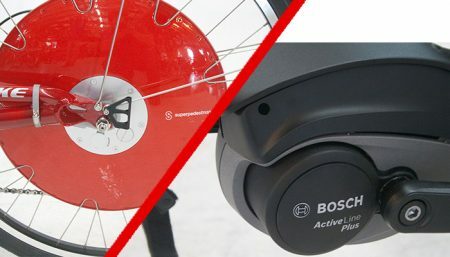 In the combined style, the assist can be overridden by the hand throttle (like the cruise control in a car) when you need a burst of speed in traffic or more power climbing a hill. When you start looking into the kits it can be shocking how much prices can vary. I want to give you some idea of what makes up the difference between cheap and worth it. I asked some of the manufacturers to explain and it seems to come down to three main things. The first was the batteries. Most use some type of lithium battery and I believe most of us think there isn’t much difference between them. What separates the men from the boys is where they come from and how much thought went into making up the battery packs. Rakesh from Falco emotors explained it this way: Falco uses batteries from Panasonic that are the same age and the same batch to build up their battery packs in a facility near to the Panasonic factory. He believes they will charge and discharge more uniformly because chemically they are as identical as can be and will respond like an organic whole. He said that some other companies mix ages and batches from cheaper battery manufacturers and each individual cell responds differently to repeated charging and discharging. There can be a big difference in how well soldered together the cells are that make up the whole battery and how much thought went into protecting the battery from overheating while charging. Another difference between cheap and worthy is in the quality of build between brands. From the outside motors look pretty much alike, inside is what counts. Some manufacturers use a similar looking motor but upgrade the bearings, wiring and insulation on the ones that they sell so that they are more reliable and then back them up with customer service and “how to” information that others just don’t do. The third difference is in what each company brings to the table. The higher end folks are looking for ways to improve their products and differentiate themselves from the competition, not just make the cheapest kit out there. Sometimes it’s improvements in software for controlling the motor with a smart phone app, other times liquid cooling for high wattage motors under heavy use to keep them running cool. Those kind of improvements cost money and improve your experience and enjoyment by working without hassles. Hopefully this introduction has helped you get a basic understanding of electric assists and the differences between the different styles. I believe they are a benefit for our customers who would keep riding if they could just get a little help.